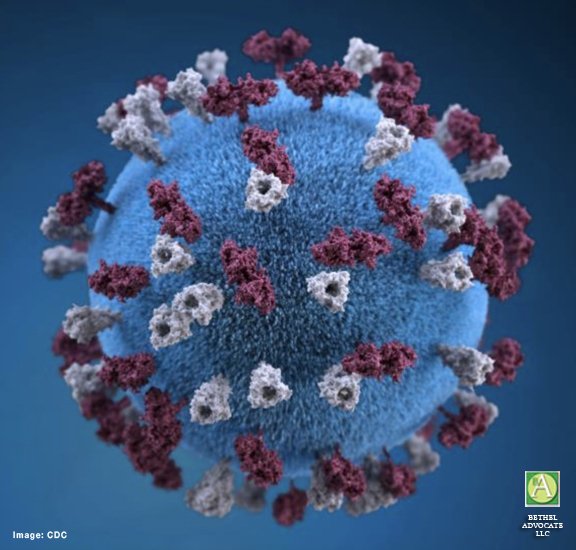 According to the CDC, this illustration provides a 3D graphical representation of a spherical-shaped, measles virus particle that is studded with glycoprotein tubercles. Those tubercular studs colorized maroon, are known as H-proteins (hemagglutinin), and those colorized gray are referred to as F-proteins (fusion). The F-protein is responsible for fusion of virus and host cell membranes, viral penetration, and hemolysis, and the H-protein is responsible for binding of virus to cells. Both types of proteinaceous studs are embedded in the envelope’s lipid bilayer. On March 26, 2019 Rockland County Executive Ed Day stated at a news conference that Rockland County has declared a state of emergency and a ban of children from public places is in effect at midnight on Wednesday, March 27, 2019, of anyone younger than 18 who is unvaccinated against the measles. The ban was put in place after the 26th week of the local outbreak occurred. The ban expires in 30 days. In order to qualify to be allowed in public spaces, minors must receive the measles, mumps and rubella vaccine. If a minor has documented and confirmed medical reasons why they are unable to be vaccinated they are then exempt from the declaration. Day said the measles outbreak began when seven unvaccinated travelers, infected with measles, entered the county in early October. The measles outbreak affected residents in Spring Valley, New Square and Monsey in Rockland County in the past few months, when officials asked students not to attend school if they were unvaccinated. Day said that because certain people are resisting being vaccinated, the ban was now put in place. He said they are trying to get the attention of the public, not arrest people. The penalty for a violation is six months in jail and/or a $500 fine. The Rockland Health Department suggests that people who think they have symptoms of measles should not go in person to a health care provider, local clinic or local emergency department but instead contact them ahead of time to prevent the spread of the illness to others. The Rockland Health Department and the New York State Health Department are coordinating their response efforts. There will be free measles, mumps, and rubella (MMR) vaccination clinics Wednesday from 1 to 3 p.m. One in Pomona and another in Spring Valley, hosted by the Department of Health.